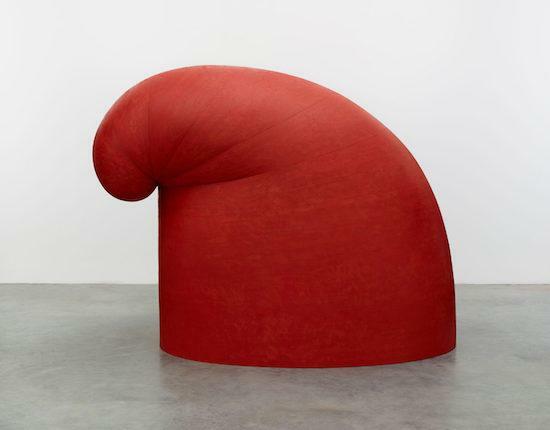 Martin Puryear’s work is richly but subtly allusive. His beautifully crafted sculptures draw on African-American history, and in scale and form they often take on a human aspect or are nebulously anthropomorphic. He uses a range of materials, from wire mesh to steel and rattan, but wood is his favoured medium. The beautifully finished surfaces of his pieces lend them an artisanal quality, acting as a rebuttal to the ‘masculine’ industrial aesthetic favoured by many Minimalists of his generation, with its credo, its non-referential ‘the thing itself’. “I looked at it, I tasted it, and I spat it out,” he once said of Minimalism. Puryear, now in his mid 70s, has had major institutional surveys in the U.S and is also well known there for his monumental outdoor commissions, but he’s barely known in this country. 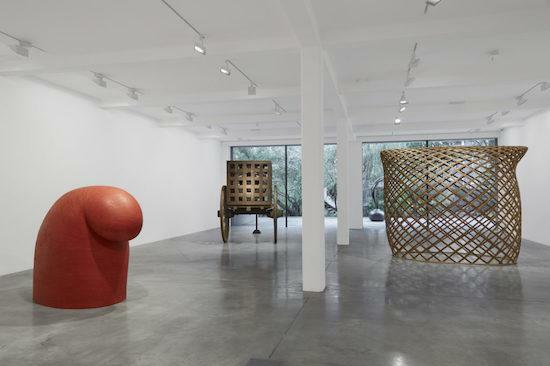 Parasol Unit’s beautifully curated and airily expansive survey spanning forty years, is a first in the UK. However, for those who visited Tate Modern’s superb, and revelatory, Soul of a Nation: Art in the Age of Black Power earlier this year, they would at least have seen one work by Puryear: Self, his 1978 black monolith. Carved from black wood, Self’s closed, dense mass resembles, from one angle, a shrouded figure. Bent down, silent, heavy with burden, its presence suggests that which is both placid and brooding, innocent and sinister, inert yet powerful. It appears to give nothing away yet is deeply expressive. On the first floor of this two-floor exhibition we find a different mood at play. One work catches the eye almost immediately, since it’s painted a bright red and is perhaps as tall as Self and certainly as bulky (Self doesn’t appear in this exhibition). Big Phrygian (2010-14), is named after the scarlet conical Phrygian cap, worn by liberated slaves in ancient Rome and later by French revolutionaries. The liberty cap, as it became know, was also taken as the emblem of the Haitian slave upraising to commemorate the country’s foundation. Scaled up it looks dumbly comical, its drooping bulbous tip like a snout or the dumbly probing head of a mollusc, or perhaps a head bowed in suppliance. Or a Noddy hat. Big Phrygian shares the space with five other large-scale sculptures, including Brunhilde, (1998–2000), an unpainted cedar and rattan latticed cage that continues both the headgear and liberty theme, and named for the Valkyrie in Germanic and Norse mythology. You’ll find heads and hats a common theme and, understandably, you might wonder if the Wagnerian reference has a political dimension too, though the commonplace racist ideology is clear enough in the figure of the composer himself. Form is as important as reference and allusion, and Brunhilde is as light, airy and capacious as Big Phrygian is all dense mass. Puryear is a hands-on artist. He works the materials himself and the work’s finish displays the craftsmanship of a master carpenter. The blond wood of Brunhilde echoes the long yellow willow grass of Night Watch (2011), in which a maple wood table is the seed bed for the grass. The long stalks are bowed as if by a breeze and reminiscent of a wheat plain in miniature. Freedom, perhaps the promise of land, of restitution. You begin to knit together connections, some kind of alternative American narrative that for decades remained unspoken, though all these thoughts are buoyantly free-flowing. The Load (2012), is a rustic two-wheel cart, bearing a wooden latticed box within which sits a glass orb, almost as big as the confines of its cage. More explicitly, we have the long, thick chain of Le Prix (2005), carved from pine and rising up, miraculously, like a charmed snake from its basket. And then a giant head, in the form of a simple wire mesh covered in tar in Untitled (1995), the tar particularly resonant for hot tar was used to cover the wounds and open sores of slaves to make them look healthy for market, though one is almost loath to talk of the work with such stark literalness. Upstairs, that work is replicated in a smaller piece in bronze, alongside a selection of smaller sculptures, elegant wall pieces – strips of taut and tensile wood bent into circles and waves – and a series of prints. Here, like the giant tarred head, you’ll find the smaller elongated head, recalling a dressmaker’s dummy, with its screw neck on flat, broad shoulders. The influence of de Chirico’s sinister wooden mannequins becomes clear. Clear too, is the reference made in the hunched, animal-like Shackled (2014), an object, like the others, of serene beauty and violence. The monochrome prints are abstract, full of biomorphic forms and squiggles, though one stands out: Untitled, (1999), could be a silhouette of an upturned classical urn with its two round handles, or the back of a woman’s head, outlining her afro hair and hooped earrings, recalling, as if this needs to be added, the politics of ‘natural hair’ as an aesthetic of the Black Power movement.